Airwave is very pleased to announce that it has become a member of the Philips Partnership program which enables closer co-operation between companies. The aim of the program is to help stimulate hotels to work with approved and trustworthy Philips Hotel TV partners to the benefit of all. In addition to this, Airwave Staff will receive further annual training sessions on the latest Philips Hotel TV range, ensuring they are ahead of the competition with all of the correct product information. This bond between Airwave and Philips reinforces the fact that Airwave has an extensive reach and knowledge of the home market and a desire to work more closely to support the brand. Tim Worrall from Airwave and Herman van Driel from Philips Hotel TV sign the PPP - contract in the UK. Airwave has again worked closely with London’s famous landmark, The Royal Garden Hotel, as it continues its ongoing refurbishment programme throughout its 400 five star rooms. 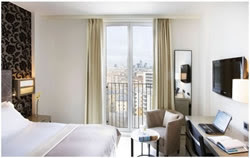 During this years phase, Airwave has supplied, installed and commissioned interactive hotel LCDs from Samsung along with high definition, bluetooth ready connectivity panels from TeleAdapt, and Blu-Ray/DVD players. The installation also included bespoke floor-to-ceiling TV mounts allowing guests to view the screen from both bed and living areas. 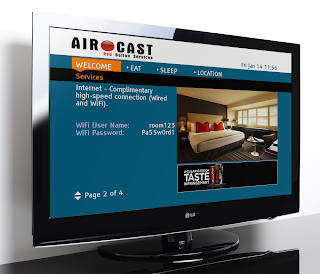 In this instance Airwave have worked closely with the incumbent IPTV supplier as requested by the hotel. When the owners of The Cumberland Hotel in Bournemouth were looking to upgrade his analogue system to digital, they turned to the team at Airwave for advice. The first hurdle was to upgrade the existing TV infrastructure in Bournemouth’s only purpose build Art Deco hotel to accommodate the new digital signals, which was completed at a much lower cost than originally expected. To compliment a major refurbishment programme in the last year, new TV’s were sought to complete the update. 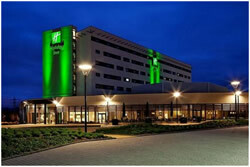 The hotel now boasts 127 of the latest Sharp Hotel mode LCD screens, some even with built in DVD. These DVDs however have been specially selected as they are modular and therefore easy to replace without necessarily removing the screen. (This is important as DVDs can suffer a higher failure rate than TV screens). To complete the solution, Airwave has also installed the new Airsign Hotel Information Channel, which highlights the hotels many services and facilities. When the dynamic and growing Spanish Chain, H10 opened its first UK hotel right in the Centre of London by Waterloo station it turned to Airwave to take care of its AV requirements. The brief was to supply choice with a simple interface. 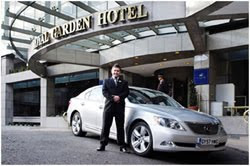 The solution was installation of the latest range of Samsung Hotel TVs as well as Airwave’s unique Stream TV product which provides international guests with the foreign language channels they need in crystal clear digital quality. Each room also benefits from the connectivity solution from TeleAdapt allowing guests to easily hook up their media to the TV screen. Thanks to Airwave, each of Holiday Inn Reading’s 174 luxuriously appointed spacious bedrooms are now adorned with 32 inch Philips Hospitality flat screen TV’s. 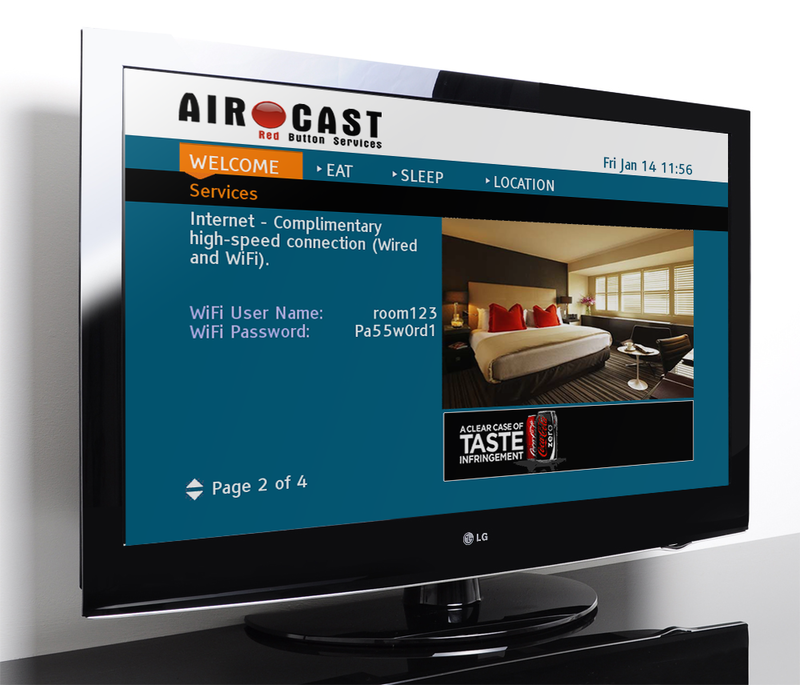 To complete the branding exercise, the Hotel has installed the Airsign hotel information channel, to keep guests updated with the current offers as well as the latest news and traffic information. An install befitting any new generation 4 star hotel!